The good news-- is there good news-- is that the bill still prohibits shooting students. And teachers have to give consent before the training. I do not even want to start imagining what kind of pressure a really crappy administrator could bring to bear if he decided that his teachers should volunteer to be shot. Nor am I sure exactly how that would work-- would teachers who volunteered to be shot wear big targets on their backs, or "shoot me" t-shirts? What would be the process for handling a little "oopsie"? Since Indiana wants to arm teachers, will the armed teachers get to shoot back? I don't know the answer to any of these questions, but I do know that active shooter training is harrowing and the addition of actual pellets--particularly delivered execution style--is a level of trauma that I can't imagine providing any useful benefits to anybody. This is a dumb idea. Of course, several wags have suggested that legislators should get to experience the same sort of training. That's a fine idea, but since the legislature controls so many aspects of Hoosier life, I don't think it goes far enough. I think they could better understand the implications of automotive regulation if they participated in crash tests. Fire regulations might carry more "reality and adrenaline" for them if they were left inside some burning buildings. If they're going to make laws about what poor folks are or are not entitled to, maybe legislators should get to experience living in extreme poverty. And since Indiana legislators have cooked up some of most restrictive abortion laws in the country, perhaps they should spend some time experiencing the reality and adrenaline of a difficult pregnancy, or maybe experience someone else having control of their reproductive organs. And for myself, I pledge to never again assume that an idea is too dumb for a bunch of legislators to even consider it. So few people are paying attention in this gerrymandered state the Super-majority could pass a law to flog teachers and still get voted back in office. The only thing you missed in that statement is that it's also a state that hates its public school teachers. The last 8-10 years has seen an annual "public education season" -- like deer season, only now we know that they'll only use pellets. They've restricted collective bargaining, stopped rewarding educational achievement (unless you call teacher "bonuses" for high student test scores a reward), and cut funding...for a start. Now we have a law that forces school boards and teachers unions to negotiate at public meetings, rather than in private. I apologize on behalf of Hoosiers for sending Mike Pence to Washington. We were hoping that getting him out of the Governor's mansion would help us. It didn't. Our legislature is filled with little "Pencelets" trying to outdo each other in their anti-union/anti-public schools behavior. 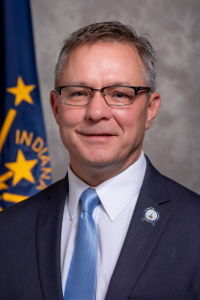 While 2020 might bring relief to the nation as a whole (God-willing), I'm afraid that there will be no change in Indiana. Vouchers, charters, and pellet guns, all aimed at public school teachers.